A surprise package from a very dear friend in Scotland which arrived on Wednesday. It was so good having something to put a smile on my face on such an emotional day. These beautiful flower hairclips are made of liquid latex and recycled materials such as broken laptops, fishing line, lace, fabric scraps, different papers, wire, beads and various packaging. Aren't they unusual and great!? 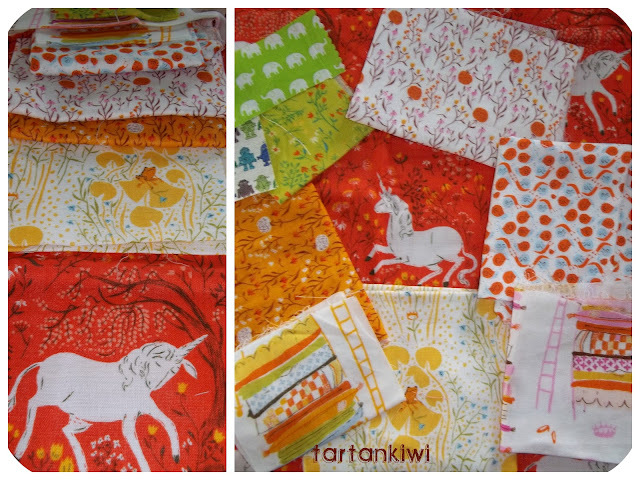 Really excited by these beautiful fabrics which also arrived on Wednesday (I love keeping the postie and the couriers busy hee hee!). The majority of these will be used for for my full sized quilt. I am really looking forward to playing with these beauties! Finally I can get started on my bee block for myself! I was really proud of Rascal yesterday when she helped me to make gingerbread biscuits for a neighbour who is under the weather. As we made the biscuits, we talked about why we were making them and how they would make the lady smile. Rascal handed them over and told our neighbour that she hoped they would make her happy- it made my heart melt! Wow those flowers are great! I like the idea of recycled flowers! that is so sweet!! Love the fabric too. Oh wow - so clever and pretty!!! ooh, how sweet that was! and the hair clips are pretty. amazing what can be done with recycled material.